Pietro Molteni was a producer of fine Italian meat products based in Arcore, a small town nearby Milan. Together with his son Ambrogio, he decided to sponsor a small cycling team in 1958. 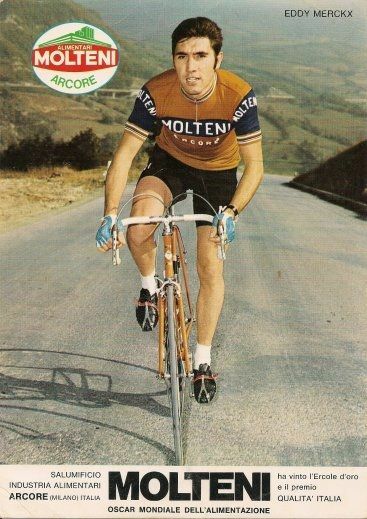 By 1967, Molteni had already won 4 Italy road race championships. It was Eddy Merckx, who joined the team in 1970, that made the Molteni team and jersey legendary. Their jersey, designed by Vittore Gianni, was simple but striking: an unusual dark brown colour paired with a dark blue stripe on the chest. When Merckx joined the team, the brown turned to a lighter shade, that the Belgian cyclist called “zucca” -pumpkin, a colour, writes Kadir Guirey, “Far more representative of Merckx’s introspective and enigmatic racing nature. We don't make a replica of the legendary Molteni jersey. But we do make retro merino wool cycling jerseys: have a look at our store!